‘Tis the Holiday Season. Those words are assaulting us from every front, especially from the media. But I prefer to call it the Family Season. Because that’s what it is for me. That’s what gives the whole November-December time frame extra meaning for me, extra pleasure, extra love. Yes, I hear from the different members of my family from time to time during the year: phone calls, texts, emails, photos, even brief visits, and I treasure those contacts. But around Thanksgiving and Christmas, I get them all, or maybe at least half of them, all together at once. Now that is special! That is a real treasure. One of my granddaughters, Jessica (third from left on the sofa) is studying baking (there’s an official name for it, but it escapes me right now) at Alfred University. She makes these fab desserts all the time and for Thanksgiving, brought a supply (one for everybody) of her Creme Brulees. 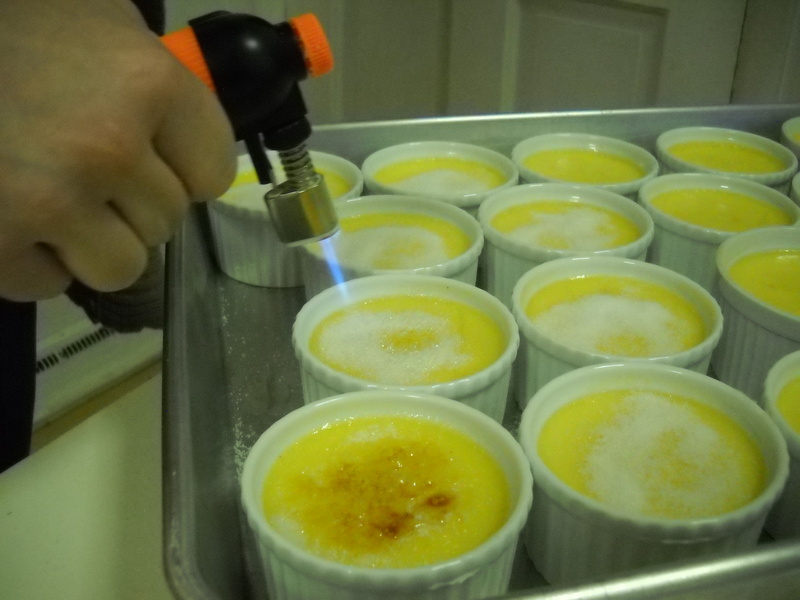 Here she is, “torching” the sugar on top of each dessert to make the sugar a brown crust. MMmmmm! 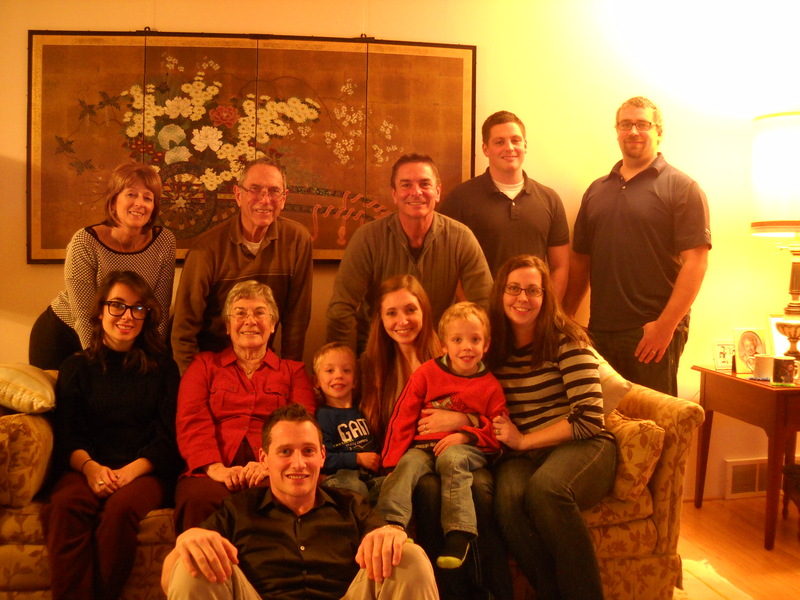 This Thanksgiving, I had the extra special treasure of having another granddaughter, her husband and their twin boys stay with me for a few (all too few!) days. So I was able to do with the five-year-old twins (Wyatt and Riley) some things I had done with their Mom many years ago. That also goes with another five-year-old great grandson (Daniel) who had come to the house earlier—before the dinner crowd. (He had another dinner to go to.) I ”just happened” to have a new Dinosaur book here, accompanied by 3-D glasses so he could see his strategically-placed stickers come to life. Watching these little guys’ interest and absorption is the best. During these past few days, the twins and I made pancakes together; they helped me make my bed; we made snowballs and a snowperson and a little fort in the snow (well, a partial fort, anyway); they let me tape their jet packs (decorated toilet paper rolls) to their backs so their Mom could “fly” them around the living room; they played with their older cousins and filled the house with thumps and squeals and little-boy laughter. And they let me sing Tura Lura Lura over and over until they dropped off to deep slumber every night. They never once complained about my flat notes or scratchy voice. So many cherished moments. Moments only the love and trust and sharing of family can transmit to treasured memories of the Family Season.